Our parish engagement survey was conducted in October 2015 in order to assess the spiritual commitment and engagement of our parish family and look for opportunities for growth in our efforts to become an amazing parish. The survey measured six areas: individual spiritual commitment, member engagement, life satisfaction, inviting others to the parish, service to the community, and giving levels. Our parish focus is centered on spiritual commitment and membership engagement. 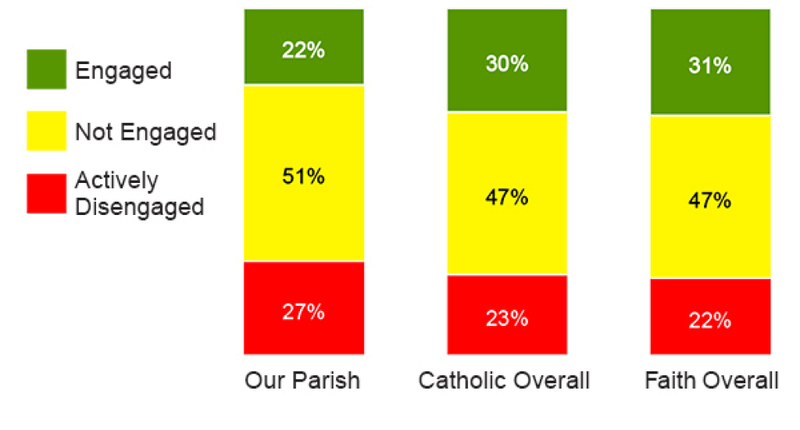 Spiritual commitment is individual and personal, while member engagement indicates a sense of belonging within the parish. Individual spiritual commitment, seen in behaviors and attitudes, is often a result of membership engagement. Engaged members have a strong spiritual and social connection to the parish. Not Engaged members may attend regularly, but their connection is more social than spiritual. Actively Disengaged members may only attend a few times a year, or, if they regularly attend, they are physically present but spiritual and social connections are absent. develop more opportunities to become more engaged as a parish family. In the coming months, the parish will announce new and exciting opportunities for parishioners to develop a deeper personal relationship with God, ways to become living disciples of Christ, and opportunities to strengthen our overall parish family. For more detailed information on the survey results, access the full Gallup report here.